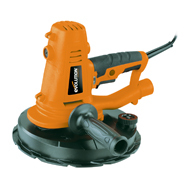 225mm Hand Held Dry Wall Sander. The unique, integrated dust extraction system means there is no need to buy an expensive, additional dust extraction machine, as all the dust is simply extracted by the power tool itself. 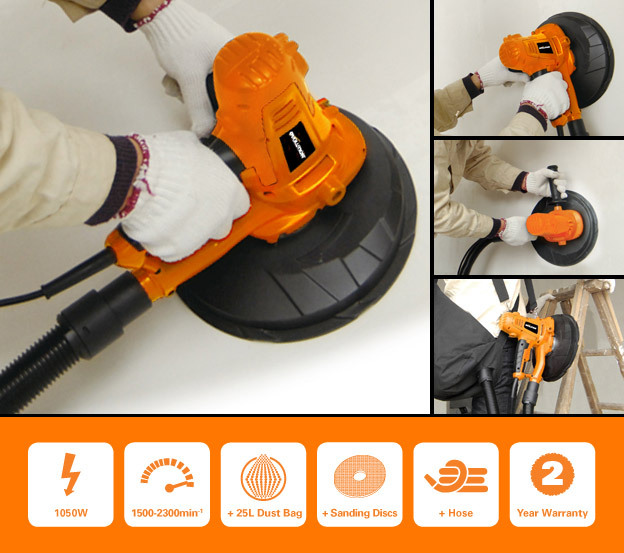 Simply connect the hose and dust bag; no vacuum cleaner is needed as the machine can remove dust by itself! Saving you time and money. The sanding head is spring loaded, and the sanding pad flexible, allowing efficient operation on walls and surfaces that are not perfectly smooth. The sanding head is also fitted with a suction regulator that allows the operator to vary the degree of suction, making the sanding process easier and less tiring. A selection of sanding discs is included in a variety of grades, ideal for achieving a superior finish for your walls! All sanding discs are quick-and-easy to attach using a 'hook and loop' system. A hose and dust bag are also supplied for use with the unique integrated dust extraction system, for a safe and dust-free working environment.